FINAT (a abbreviation of the French title: Féderation INternationale des fabricants et transformateurs d'Adhésifs et Thermocollants sur papiers et autres supports) is all about labels and people. In 2008 FINAT celebrated its 50th anniversary, its Golden jubilee. Building on the success of the Coal and Steel Treaty, six countries expanded cooperation to other economic sectors. In 1957, Germany, France, Italy and the Benelux countries signed the Treaty of Rome, creating the European Economic Community (EEC), or 'common market'. The idea was for people, goods and services to move freely across borders. One of the objectives of the Treaty was to transform the conditions of trade and manufacture in the territory of the Community. The Treaty set the scene for further cross border cooperation at sector level and this culminated in the foundation of various European associations in subsequent years. 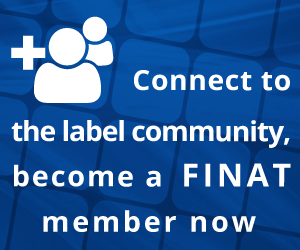 The full success story of FINAT can be found in the publication 'United in Labels' which was published on the occasion of our 50th anniversary in 2008. Contact the Secretariat in case you wish to receive a copy.